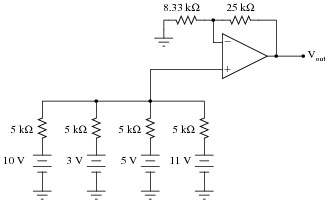 Follow-up question: what would be required to get this circuit to output the exact sum of the four input voltages? This question not only provides practice analyzing the behavior of a summer circuit, but also analyzing the behavior of a passive averager circuit. If your students need some refreshing on how to analyze the passive averager, you might want to review Millman's Theorem with them. 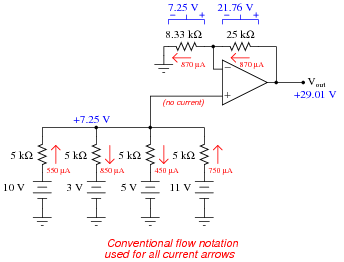 This question, while being an application of Kirchhoff's Current Law, is also a prelude to an inverting summer circuit, where an opamp takes that 6.5 mA (total) current and converts it into an output voltage. This question is best preceded by #02516, which asks for students to solve for the current between A and B with no opamp in the circuit (simply grounded at point B). When students realize that point B is now a virtual ground instead of a real ground, they see that the same conclusion derived by Kirchhoff's Current Law in the passive circuit is still valid in this active circuit, and that the result is an output voltage corresponding to that current. Identify some of the distinguishing characteristics of inverting and noninverting summer circuits. How may you identify which is which, and how may you determine the proper resistor values to make each one work as it should? I won't directly answer the questions here, but I will give some hints. 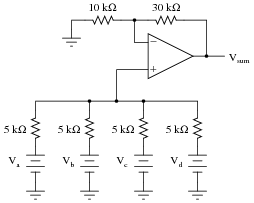 A noninverting summer circuit is composed of a passive voltage averager circuit coupled to a noninverting voltage amplifier with a voltage gain equal to the number of inputs on the averager. An inverting summer circuit is composed of a passive current summer node coupled to a current-to-voltage converter. This question is designed to spur discussion amongst your students, exchanging ideas about each circuit's defining characteristics. Having students explore each circuit type on their own, reaching their own conclusions about how to differentiate the two, is a far more effective way of making them understand the differences than simply telling them outright. What pattern do you notice in the data? What mathematical relationship is there between the two input voltages and the output voltage? Thought it may be tedious to calculate the output voltage for each set of input voltages, working through all the voltage drops and currents in the opamp circuit one at a time, it shows students how they may be able to discern the function of an opamp circuit merely by applying basic laws of electricity (Ohm's Law, KVL, and KCL) and the "golden assumptions" of negative feedback opamp circuits (no input currents, zero differential input voltage). 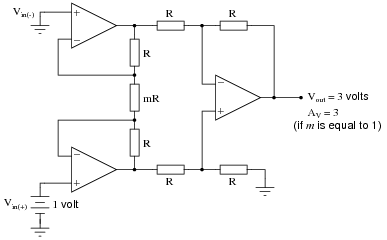 How does the operation of this difference amplifier circuit compare with the resistor values given (2R = twice the resistance of R), versus its operation with all resistor values equal? 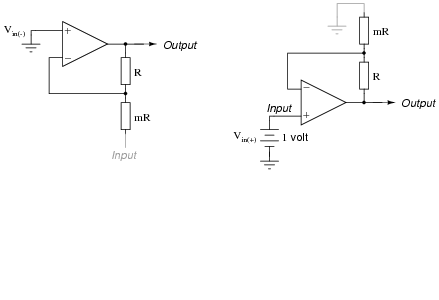 Describe what approach or technique you used to derive your answer, and also explain how your conclusion for this circuit might be generalized for all difference amplifier circuits. It is very important that you develop the skill of ëxploring" a circuit configuration to see what it will do, rather than having to be told what it does (either by your instructor or by a book). All you need to have is a solid knowledge of basic electrical principles (Ohm's Law, Kirchhoff's Voltage and Current Laws) and know how opamps behave when configured for negative feedback. It is easy for you (the instructor) to show how and why this circuit acts as it does. The point of this question, however, is to get students to take the initiative to explore the circuit on their own. It is simple enough for any student to set up some hypothetical test conditions (a thought experiment) to analyze what this circuit will do, that the only thing holding them back from doing so is attitude, not aptitude. This is something I have noticed over years of teaching: so many students who are more than capable of doing the math and applying well-understood electrical rules refuse to do so on their own, because years of educational tradition has indoctrinated them to wait for the instructor's lead rather than explore a concept on their own. If the two wires are run parallel to each other the whole distance, so as to be exposed to the exact same noise sources along that distance, the noise voltage at the end of the bottom wire will be the same noise voltage as that superimposed on the signal at the end of the top wire. Explain how the difference amplifier is able to restore the original (clean) signal voltage from the two noise-ridden voltages seen at its inputs with respect to ground, and also how the phrase common-mode voltage applies to this scenario. "Common-mode" voltage refers to that voltage which is common to two or more wires as measured with reference to a third point (in this case, ground). The amplifier in the second circuit only outputs the difference between the two signals, and as such does not reproduce the (common-mode) noise voltage at its output. Challenge question: re-draw the original (one wire plus ground) schematic to model the sources of interference and the wire's impedance, to show exactly how the signal could become mixed with noise from source to amplifier. Differential signal transmission is a very practical application of difference amplifiers, and forms the foundation of certain data transmission standard physical layers such as RS-422 and RS-485. The circuit works on the principle that vocal tracks are usually recorded through a single microphone at the recording studio, and thus are represented equally on each channel of a stereo sound system. This circuit effectively eliminates the vocal track from the song, leaving only the music to be heard through the headphone or speaker. Explain how the operational amplifiers accomplish this task of vocal track elimination. What role does each opamp play in this circuit? The first two opamps merely "buffer" the audio signal inputs so they do not become unnecessarily loaded by the resistors. The third opamp subtracts the left channel signal from the right channel signal, eliminating any sounds common to both channels. Challenge question: unfortunately, the circuit as shown tends to eliminate bass tones as well as vocals, since the acoustic properties of bass tones make them represented nearly equally on both channels. Determine how the circuit may be expanded to include opamps that re-introduce bass tones to the "vocal-eliminated" output. Circuits like this are great for illustration, because they show practical application of a principle while engaging student interest. One of my students, when faced with the challenge question, suggested placing a high-pass filter before one of the subtractor's inputs, eliminating bass tones at one of the inputs and therefore reproducing bass tones at the subtractor output. This is a great idea, and shows what can happen when students are given a forum to think creatively and freely express ideas, but there are some practical reasons it would be difficult to implement. The concept works great if we assume the use of a perfect HP filter, with absolutely zero phase shift and zero attenuation through the entire pass-band. Unfortunately, real filter circuits always exhibit some degree of both, and so the process of subtraction would not be as effective as necessary to eliminate the vocals from a song. Follow-up question: why did I choose to set the noninverting input voltage at +1 volts and ground the inverting input? Should we not be able to calculate gain given any two input voltages and a value for m? Explain the purpose behind my choice of input voltage conditions for this "thought experiment." While the relationship between instrumentation amplifier differential gain and m may be looked up in any good opamp circuit textbook, it is something that your students should learn to figure out on their own from the data in the table. Find the datasheet for a real instrumentation amplifier (packaged as a single integrated circuit) and bring it to class for discussion with your classmates. Analyze and discuss the inner workings of the circuit, and some of its performance parameters. If you do not know where to begin looking, try researching the Analog Devices model AD623, either in a reference book or on the internet. I'll leave the discussion up to you and your classmates. With any luck, you should have found some example circuits showing how the instrumentation amplifier may be used, or possibly some application notes to complement the datasheet. The idea of this question is to get students researching real integrated circuit applications, to teach them how to do this research and also how to interpret what they find. Since there are so many high-quality instrumentation amplifiers already built and packaged as monolithic units, it is usually not worth the technician's time to fabricate one from individual opamps. However, when specifying a pre-built instrumentation amplifier, it is essential to know what you need and how to use it once it arrives! Complete the table of values for this opamp circuit, calculating the output voltage for each combination of input voltages shown. From the calculated values of output voltage, determine which input of this circuit is inverting, and which is noninverting, and also how much differential voltage gain this circuit has. Express these conclusions in the form of an equation. 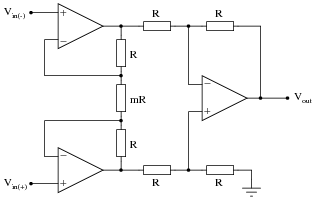 Follow-up question: explain how this circuit is at once similar and different from the popular ïnstrumentation amplifier" circuit. Although it would be easy enough just to tell students which input is inverting and which input is noninverting, they will learn more (and practice their analysis skills more) if asked to work through the table of values to figure it out. 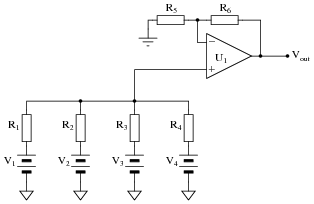 CMR measures the degree to which a differential amplifier ignores common-mode signals. Follow-up question: what range of CMR values would you expect from a good differential amplifier, if subjected to the test shown in the schematic and CMR calculated by the given formula? In case some students do not recall (! ), the logarithmic formula is nothing special. It simply provides an answer in units of decibels. 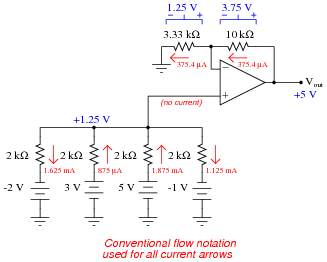 Explain what common-mode rejection ratio means for a differential amplifier, and give a formula for calculating it. 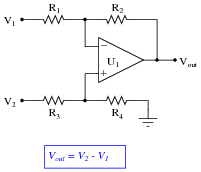 Common-mode rejection ratio compares an amplifier's differential voltage gain to its common-mode voltage gain. Ideally, CMRR is infinite. An application that really shows the value of a high CMRR is differential signal transmission, as shown in question #02519. For those students not grasping the significance of CMRR, this would be a good example circuit to show them. Resistor R1 fails open: Vavg becomes the average of V2 and V3 only. Solder bridge (short) across resistor R1: Vavg becomes exactly equal to V1. Resistor R2 fails open: Vavg becomes the average of V1 and V3 only. Solder bridge (short) across resistor R2: Vavg becomes exactly equal to V2. Resistor R3 fails open: Vavg becomes the average of V1 and V2 only. Solder bridge (short) across resistor R3: Vavg becomes exactly equal to V3. Resistor R1 fails open: Vout becomes equal to 4/3 the sum of voltages V2, V3, and V4. Solder bridge (short) across resistor R3: Vout becomes equal to 4 times V3. Resistor R4 fails open: Vout becomes equal to 4/3 the sum of voltages V1, V2, and V3. Resistor R5 fails open: Circuit operates as an averager, not a summer. Solder bridge (short) across resistor R5: Vout saturates in a positive direction. Resistor R6 fails open: Vout saturates in a positive direction. Resistor R1 fails open: Vout becomes (inverted) sum of V2 and V3 only. Resistor R2 fails open: Vout becomes (inverted) sum of V1 and V3 only. Solder bridge (short) across resistor R3: Vout saturates in a negative direction. Resistor R4 fails open: Vout saturates in a negative direction. Solder bridge (short) across resistor R4: Vout goes to 0 volts. Resistor R1 fails open: Vout becomes equal to 1/2 V2. Resistor R2 fails open: Vout saturates. Solder bridge (short) across resistor R3: Vout becomes equal to 2 V2 - V1 instead of V2 - V1. Resistor R4 fails open: Vout becomes equal to 2 V2 - V1 instead of V2 - V1. 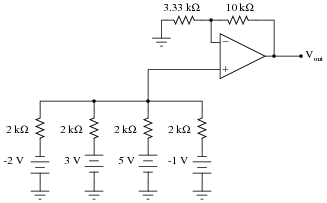 Solder bridge (short) across resistor R4: Vout becomes equal to -V1. There is an equation describing the differential gain of an instrumentation amplifier, but it is easy enough to research so I'll leave that detail up to you. What I'd like you to do here is algebraically derive that equation based on what you know of inverting and noninverting operational amplifier circuits. Note which configuration (inverting or noninverting) each of these circuits resemble, develop transfer functions for each (Output = � Input), then combine the two equations in a manner representing what the subtractor circuit will do. Your final result should be the gain equation for an instrumentation amplifier in terms of m.
This question actually originated from one of my students as he tried to figure out an algebraic explanation for the instrumentation amplifier's gain! I thought the idea was so good that I decided to include it as a question in the Socratic Electronics project. Astute students will note that the negative sign in the inverting amplifier equation becomes very important in this proof. As an instructor, I often avoid signs, choosing to figure out the polarity of the signal as a final step after all the other arithmetic has been completed for a circuit analysis. As such, I usually present the inverting amplifier equation as [(Rf)/(Rin)] with the caveat of inverted polarity from input to output. Here, though, the negative sign becomes a vital part of the solution! Follow-up question: can you think of any interesting applications for a circuit such as this? Challenge question: modify the circuit so that the range of voltage gain adjustment is -6 to +6 instead of -1 to +1. Ask your students how they approached this problem. How, exactly, did they choose to set it up so the solution became most apparent?